When looking to sound proof your home, it is essential to know that sound travels through everything. Sound will therefore be coming into your home through your roof, walls, floor and also your windows. Sound is a form of energy and is caused by molecules vibrating together. These vibrations are known as sound waves. The frequency or pitch of noise is measured in hertz (Hz), and the level or intensity of noise is measured in decibels (dB). The higher the decibels, the louder the sound. Decibels are measured on a logarithmic scale. This means, every increase of 10 dB is equal to a 10-fold increase in sound pressure level (SPL). Complete silence is expressed as 0 dB but a sound measured at 10 dB is actually 10 times louder. If a sound is 20 dB, that’s 100 times louder than near silence. 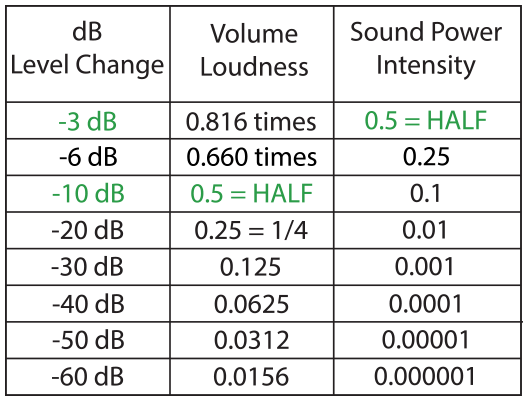 The table below shows this information in reverse, with a decrease in decibels (dB). A decrease of 3 decibels halves the sound intensity. Therefore a small decrease in decibels represents a large decrease in intensity. However, a decreased change of 10 decibels is perceived as halving the noise level. Windows are generally the weakest part of the home for sound proofing, as they act as the path of least resistance. This is especially true if your windows do not seal properly, as sound will easily travel inside. Thicker materials will reduce more sound. Therefore, a thicker frame or thicker glass pane will reduce more sound, and a wider cavity between the glass will further reduce the sound. Specific acoustic glass is highly recommended for best results. Acoustic glass consists of two or more sheets of glass, bonded together with one or more acoustic interlayers. The interlayers act as a noise dampening core, weakening the sound waves as it travels through the glass. 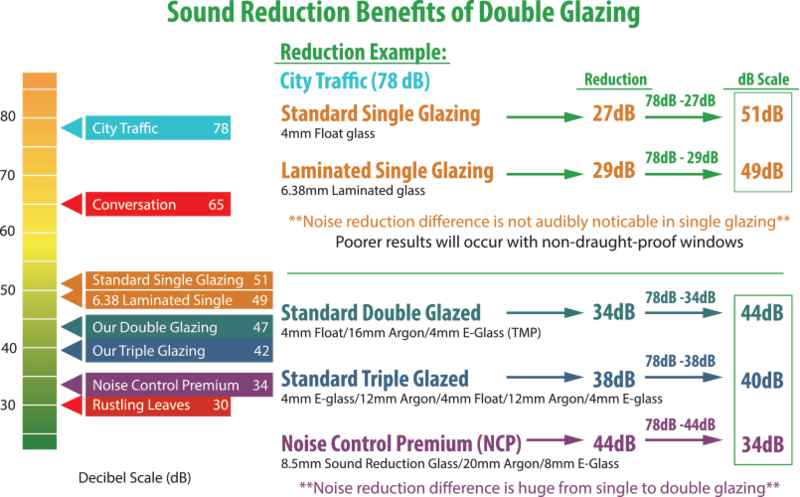 Many people are misled, and believe that replacing an existing single glazed window with an acoustic glass will drastically reduce sound. This is unfortunately incorrect. A single glazed 4mm aluminium framed window, will reduce about 27 decibels of outside noise. However, a laminated 6.38mm single glazed aluminium window will only reduce 29 decibels, which is not audibly noticeable to the human hear. Also, if the frame is currently performing poorly then a change in the glass will do little for sound reduction. Many companies will specify a huge reduction in sound with a specific glass selection, but don’t test these results with a frame or a specific opening style. Testing the glass only, will give a much greater result than if tested within a frame. A sliding or double hung window style, also performs worse than an awning or tilt and turn system. Oknalux windows are tested with both glass and frames for a more accurate result, and the results far exceed a laminated single glazed option. With our ‘Noise Control Premium’ option we can reduce sound by 44 decibels, turning a noisy street into a much more comfortable environment inside.